Growing up, summer has always been my favourite season. I remember being in tears when summer break was over and it was time to go back to school. I dreaded the cold weather and I used to wear my summer clothes as long as I possibly could. Now, oddly enough, my favourite season is the fall. As an adult you appreciate things differently than when you were in your younger years. The crisp air and crunch of the leaves under my feet as the summer fades away has become something I get excited for. Like, really, really excited. What can I say, I love being cosy with my oversized scarves and trendy boots. If you like autumn like me, you know that it also means making comfort food and making time for all the little ways the cooler weather encourages you to take care of yourself and your home. Having the right seasonal accessories sure does make the transition easier. I was thrilled to get the fall Simply Beautiful Box from the lovely BC Living team, the same team that curated the Extraordinary Man Box. This box was filled to the brim with some fantastic essentials for fall that will keep you and your home warm and cheerful. There were so many awesome products in this box that I couldn't pick just one fave. This box is valued at $238 CAD (yes...really!) and is a great deal if you're looking for some useful items to refresh your fall essentials. 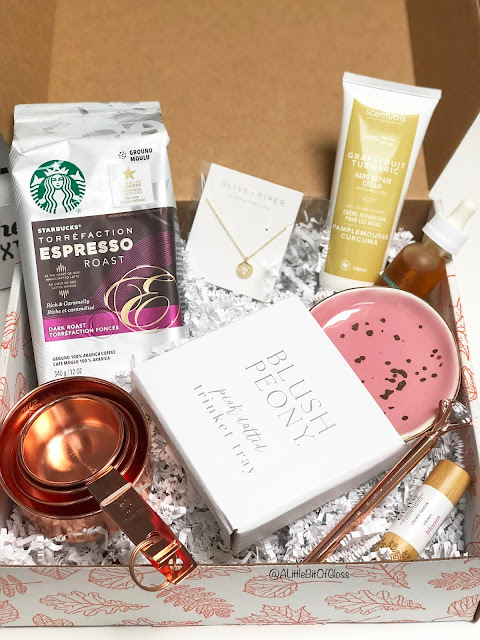 There were 8 items in the fall 2018 box and each item is perfect for anyone looking for a seasonal box of goodies. I'm really impressed with the wide variety of products! Olive + Piper necklace- I feel like the Simply Beautiful curators really get me. The Olive + Piper necklace looks so pretty up close that pictures don't do it any justice. It's just dainty enough to add a touch of class to your wardrobe, but sparkly enough if you're wearing it out on the town. The chain can be adjusted to suit your preference- from 15 to 18 inches. If cute necklaces like this aren't your thing, you can save this gem as a stocking stuffer since 'you- know-what' is just around the corner!! 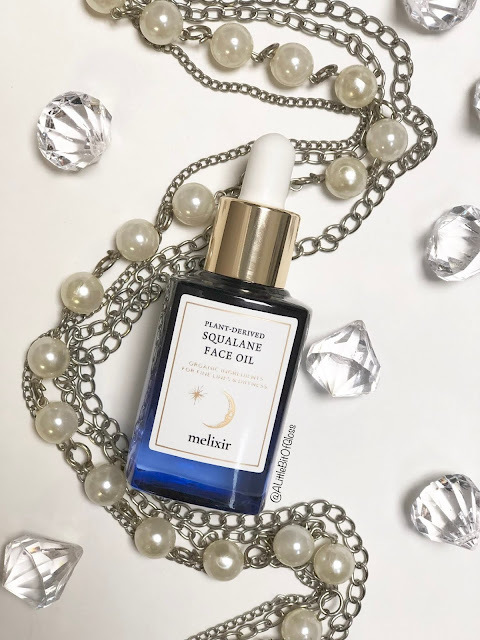 Huna Age-Grace face serum- If you've been reading along, you know that skin care is my jam so when I saw this serum my inner skin care nerd was jumping for joy! This serum promises to deliver deep hydration, antioxidant protection, as well as a healthy glow. I love that this serum is formulated with all natural ingredients like organic carrot tissue oil, green tea, and rosemary extract. I used this a few times as part of my evening skin care routine and I did notice a healthy glow the next morning. It's too soon to tell if this will be a regular product for me, but so far it's a keeper! Blush Peony rose gold measuring cups- I must admit, kitchen items never really excited me...until now. These rose gold measuring cups are the perfect kitchen accessory that adds some style and flare. Not only are these measuring cups sturdy, there the most Instagrammable kitchen accessory I've ever seen! Scentuals grapefruit and turmeric hand cream- I don't know about you, but my skin gets super dry in the colder months. I must have tried every lotion on the market! The Simply Beautiful Box featured the Scentuals grapefruit and turmeric hand cream and I'm grateful for this amazing product. Much needed! It absorbs quickly, smells great, and leaves my skin moisturized. What more could I need? Elate Cosmetics lipstick- I was happy to see a brand I wasn't familiar with and the Elate lipstick was a hidden treasure! This lipstick left my lips feeling nourished and the colour is flattering for all skin tones. I felt good knowing this brand uses vegan and sustainable ingredients. 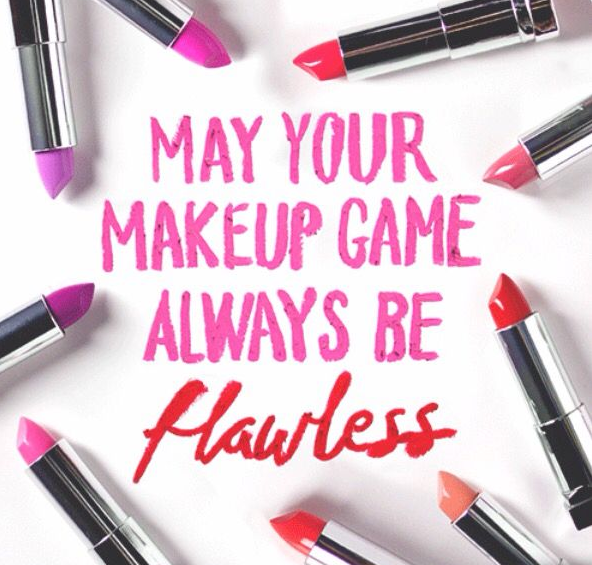 Clean beauty for the win!! Simply Beautiful trinket tray- I loved the simplicity of this trinket tray and it perfect for holding my Olive + Piper necklace! The tray is ceramic and goes well with most feminine decor. The gold flakes are a nice touch. I feel motivated to tidy up my vanity now! Blush Peony rose gold diamond pen- Call me an old lady all you want, but there's something about taking notes with a nice pen that I just love. 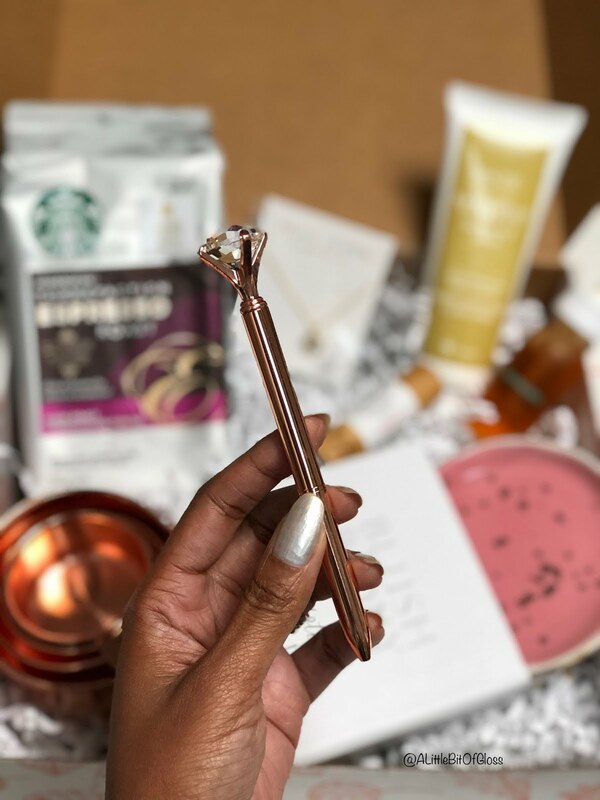 The Blush Peony rose gold pen is my favourite item in this box! Be prepared to see this pen all over my Instagram feed since the gem on the top of the pen is a real beauty. Starbucks Espresso roast ground coffee (full size bag)- It was a nice treat to get a full sized bag of the Starbuck Espresso roast coffee. I'm an avid tea drinker, but once in a while I love having a nice warm cuppa joe. Like all Starbucks coffees, this Espresso roast tastes delicious and would be perfect for cold fall days when you want to cozy up and savour the rich flavour. love those measuring cups!! so pretty!